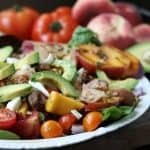 This Summer Chicken Salad with Tomatoes, Grilled Peaches and Cumin Lime Vinaigrette came about because of my love for tomatoes. I can not even tell you how much I love fresh tomatoes. This love affair began when I moved to California until then, I don’t think I really knew how good tomatoes could be. When I moved to Seattle (after living 18 years in California) I was devastated because I couldn’t grow tomatoes in the first house we lived in. I even had to start buying cherry tomatoes in the winter because the bigger ones were so anemic. When we decided to build a house, my tomato garden was my top priority- how much sun would my garden have? Would it be enough? We picked our lot based on my garden. After doing a ton of reading and research on how best to grow tomatoes in the Pacific Northwest, I discovered you needed to plant them against the wall of the house that gets lots of sun. When the side of the house heats up the wall, it gives the tomatoes the needed heat and helps them grow. At the moment I have about 25 tomato plants in various forms (cherry, Roma, Sun Gold, Early Girl, Heirloom, etc). They start ripening in late July. I pick them fresh for salads and salsas, make big batches of tomato sauce as well as roast huge batches to freeze to use in the winter months. Originally I had planned on creating this salad with basically tomatoes, some veggies but no lettuce but this salad had other ideas and took on a life of it’s own. It evolved into something I totally hadn’t expected. I love it when that happens! I start with one idea, it percolates and it becomes something totally unexpected and amazing! 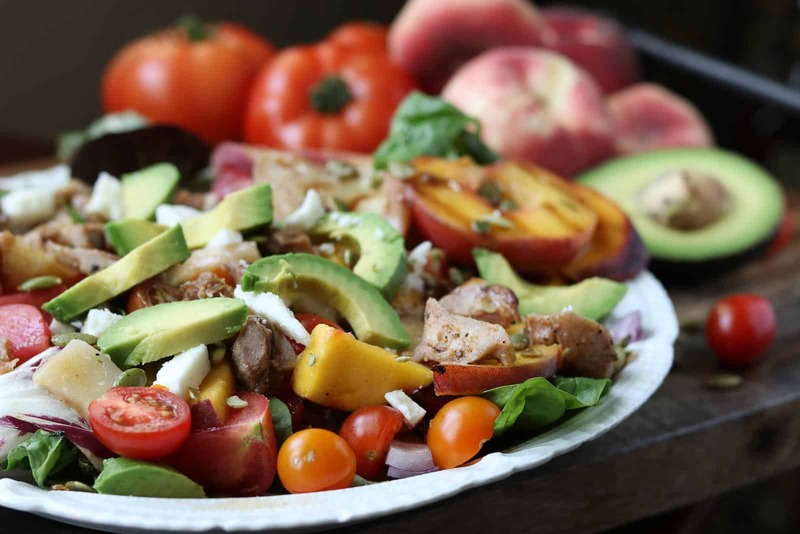 This Summer Chicken Salad with fresh tomatoes, grilled peaches, avocados, toasted pumpkin seeds and Cumin Lime Vinaigrette is absolutely fantastic and will wow your guests. This makes 4 large main salads, or you can portion out less for side salads. It’s great without the chicken or the avocados as well. 2 oz queso fresco cheese (optional) about 4 T.
4 T. pumpkin kernels (without shell) I like to do a big batch and store in ziplock bags so feel free to do more! In a small bowl or liquid measuring cup, add avocado oil (or olive oil), minced garlic, lime juice, thyme, oregano, cumin, salt, water, honey and cilantro. Mix well or use an immersion blender to blend. Set aside or put in refrigerator. Spray a baking sheet with olive oil spray or place down parchment on a baking sheet. Spread pumpkin kernels around and spray with olive oil. Sprinkle salt and cumin over the top. Broil until lightly toasted, about 1-2 minutes. Allow to cool. Slice peaches into thick slices, but leave on peel. With a basting brush, brush peaches with a little of the Cumin Lime Dressing. Grill for 1-2 minutes until you see grill marks. Not very long. Or pan fry for a few minutes. You can leave them in large slices for the salad or cut them into smaller pieces after they are grilled. In individual bowls, combine 4 c. lettuce and 1 c. spinach per person. To each bowl add: 2 oz chicken, 1/4 of the avocado pieces, 1 c. tomatoes, 1 T. red onion, 1 T. bacon crumbles. Arrange grilled peaches on top. Sprinkle with black pepper. Sprinkle 1 T. cheese and 1 T. toasted pumpkin seeds on top of each salad. Top with 2 T. Cumin Lime Vinaigrette over each salad. Enjoy! This makes a great side salad without the chicken. If you need to save on points, leave out the cheese or avocado, the tomatoes and peaches are the main attraction. No Replies to "Summer Chicken Salad with Tomatoes, Grilled Peaches and Cumin Lime Vinaigrette"